Oh me oh my, dear Readers, has life been eventful since my contraptions last stumbled upon the worldwideweb! So eventful, in fact, that I can’t possibly fit it into one snack-sized entry, but will lovingly drip-feed it into your veins over the next few days. Suffice to say, last night witnessed an unplanned and rather hair-raising jeep voyage in pitch darkness and we were almost forced to sleep with giant black hogs, but all is probably maybe well now. 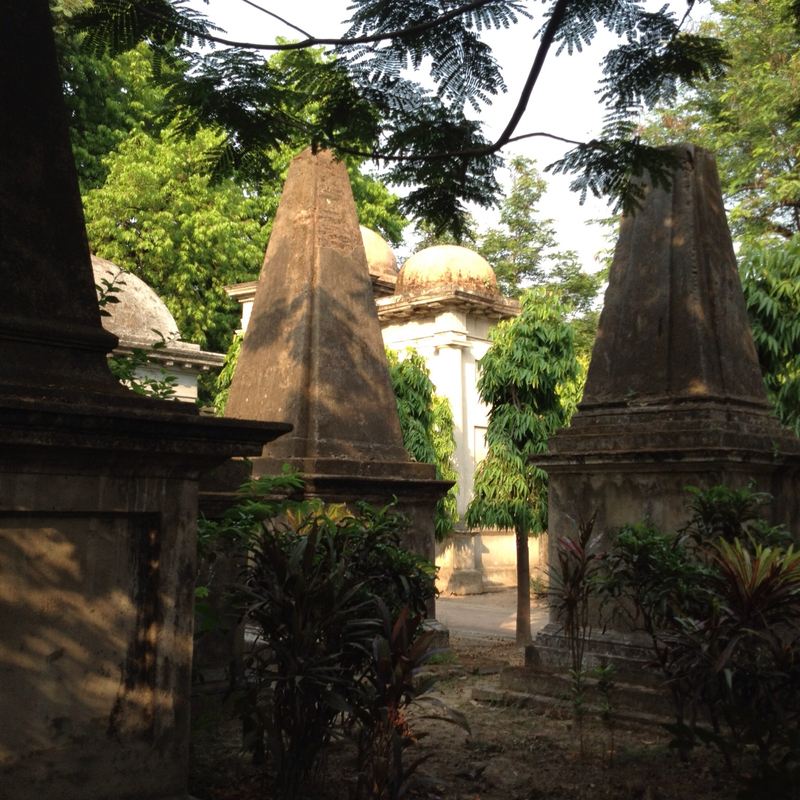 When we left you, we were enjoying Calcutta’s sticky charm—belated thanks for the hospitality, chai, and song of the lovely Sandra and Sahar. In a moment of classic Chatterjee military precision, about three minutes after posting the last entry we realised that we (here Hannah points out it should probably be ‘I’) had got wrong (a) the duration, (b) the time, and (c) the date of our train to Darjeeling. the famous beauty of eighteenth-century Calcutta, who, as Miss Sanderson, was universally popular if we may believe contemporary reports. At one ball she is said to have confidentially advised each of her suitors beforehand of the costume that she would wear. Each attired themselves to match her dress, and some ten or twelve young men turned up in an identical shade of pea-green. 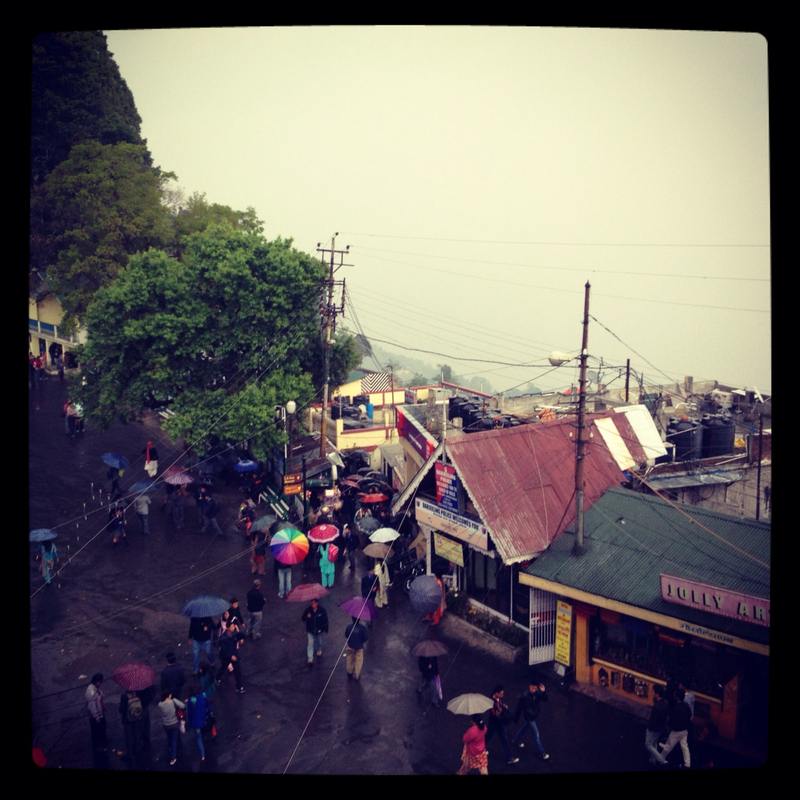 City perused, we hopped aboard the Darjeeling Mail. Like all Indian trains, its creaking sky-blue carriages—some Raj-era—stretch for several hundred metres, each hand-stencilled with a category and class as precise and rigid as the caste system. Unlike our earlier Delhi-Calcutta trip aboard the 25-hour Poorva Express (the title ‘express’, like ‘5-star’, is an Indian euphemism which means the exact opposite), the trip alas wasn’t long enough to warrant dining: Indian trains have everything from the hourly Chaicoffee…chaicoffee drone and puffed-rice-and-crosswordwallahs, to hot meals (‘Wedge or non-wedge, madam?’) which arrive a random number of hours after the order—often while everyone is in bed, as in the case of the dribbly curry from a beaming Bangladeshi that soaked luridly orange into my pillow on the Express. Instead we tucked into our plasticky sky-blue bunks and regulation blankets, alongside our fellow middle-class ‘AC’ passengers. 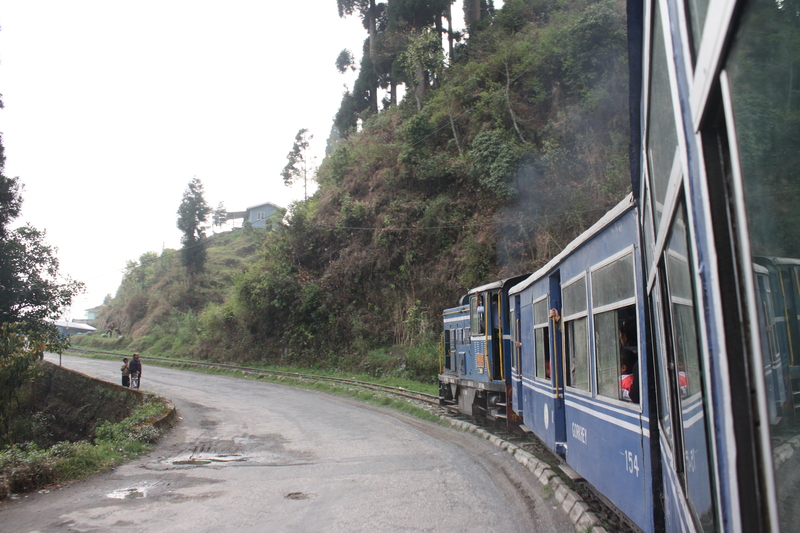 Halfway up, in the tiny town of Kurseong which staggers across the slopes, we deboarded again, optimistically clutching tickets for the famous toy train. 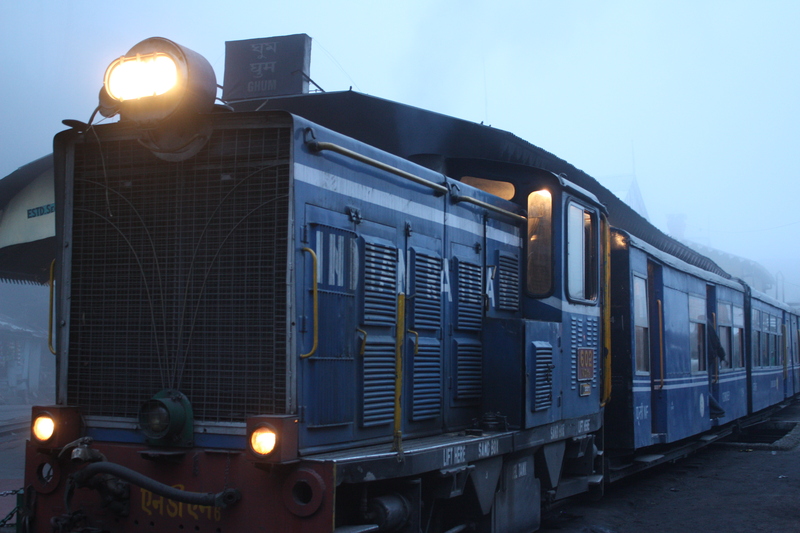 A mere 2.5 hours late, and chugging diesel not steam, it set off into the fog. 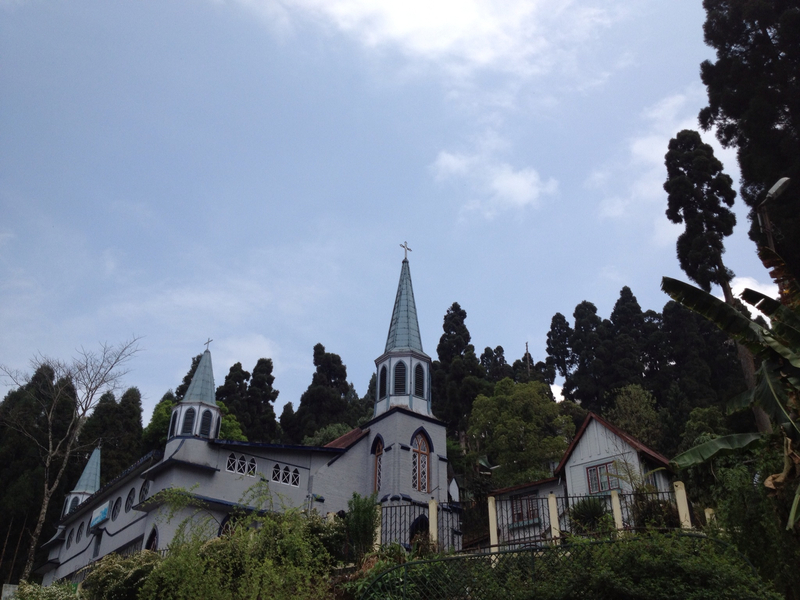 Darjeeling calls itself the queen of hill stations, but it has suffered Edith Piaf-like from its fame. 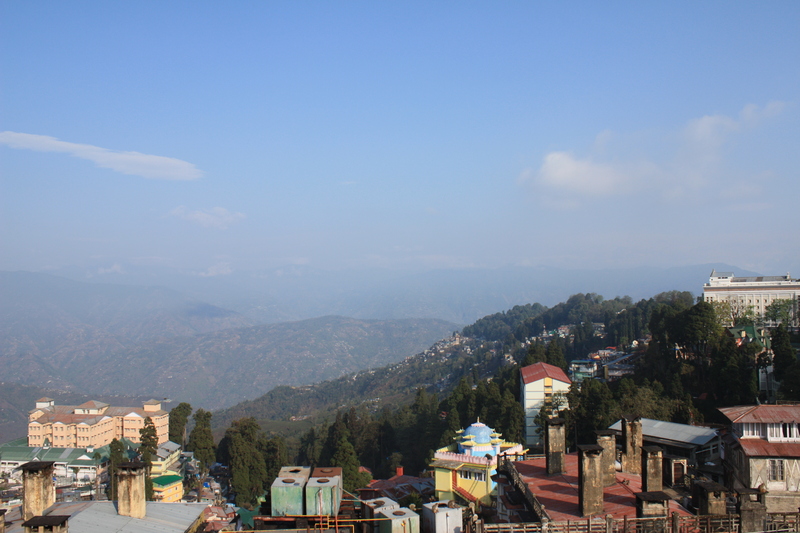 The town itself is now less colonial paradise than a jauntily hunched, haggard collection of concrete pillboxes and shawl shacks clinging to the hillside. The views and countryside apparently more than make up for it, but I can’t confirm this as the Bengal skies took the opportunity for some imperial nostalgia, and pissed it down royally for two days. Sheltering from the showers, we attempted to live colonially. Attempt 1 was a slight failure. Undeterred by reviews that compared it to a haunted house, we stayed a night in an old mansion an estate agent might describe as ‘having potential’. A first glance at our room revealed a spider the size of a small yak sitting in the corner. These gigantic beasts were my old hill station nemeses in Mussoorie, and are (a) unappealingly poisonous and (b) partial to climbing into the covers for warmth/sadistic thrills. My shriek roused the staff, who managed to lose the spider but conducted a very bad twitchy-eyed pretence of manfully slaying it. A few minutes later and the yak was back, grooming itself on the curtains. Highly traumatic. Attempt 2 was also a bit of a damp squib. Afternoon tea at the ‘Windamere’ (apparently a century-old misspelling, but accurately ominous nonetheless) brought back memories of GCSE Food Tech, seemingly in an old lady’s boudoir. But a cocktail tour of the two swankiest hotels was better, and we then found ourselves in a themed 60s bar at the rocknroll hour of 9pm, when everything else is shut and Darjeelingwallahs have settled down to some hilly knitting. Sikkimese permit safely collected, we decided to bust out. God was displeased. Appropriately for Good Friday, biblically torrential rain pelted the town—impressively effective at sorting out which of our North Face gear was fake. Streams thrust through piles of spherical hailstones like icy lava, carrying cartons and dirt downstream. A small byline in a local paper the next day announced that five people were struck by lightning. ‘2012, the year the world ends!’ a couple of optimists commented. Half an hour to the last jeep for Pelling, West Sikkim. We waded out into the freezing water, shoes waterlogged and bags soaked, plunged down stone stairs with ice setting, seized a likely-looking lad. Cold, dishevelled, and smelling faintly like soggy dog, we had escaped.